Children, our most valuable resource, make up one third of the world’s population. Yet, in many places around the globe, children are not being allowed to realize their full potential. Migrants and refugees are among the most vulnerable, often denied access to an education and the hope of a better future. Of particular concern are the migrant children at the U.S.–Mexican border. The number of those children detained in the United States has skyrocketed from 2,400 in May 2017 to 12,800 in September 2018. As an organization whose mission is quality learning for all, Kappa Delta Pi (KDP) strongly urges federal and state authorities to ensure that all children have access to a high-quality education and appropriate educational services that address their special needs. Serving migrant children is different from working with other “newcomers.” Educators need to understand the economic and educational conditions in the countries from which students are arriving; some students have attended school, while others have never had any formal education. U.S. federal regulations stipulate that the curriculum needs to promote diversity, reflect cultural sensitivities, and challenge prejudices. Unfortunately, some textbooks include highly politicized and discriminatory views. In many locations, the education being provided in refugee settings is plagued by untrained teachers, few resources, and language barriers. In 2018, the Associated Press polled 61 public school districts to find out what educational services are being provided to students in migrant shelters. Of the 50 districts that responded, most said that they had no contact with either the shelter or the Department of Health and Human Services, which is ultimately responsible for providing education services to migrant children. Achieving a world that is equitable and free of violence starts with a quality education for all children. Education is the path to a better future, access to which is the right of all children, including migrants. Children are our collective future. KDP will steadfastly work to ensure that its mission of a quality education becomes a reality for all children. As an initial step, KDP—in partnership with the Kino Border Initiative, the La Posada Providencia School, and the San Antonio Veterans Institute—has launched a Backpacks of Hope campaign to provide the children housed in Nogales, AZ, and La Posada Providencia in San Benito, TX, with backpacks containing coloring books, crayons, and toiletries. KDP wants to provide these children, after arriving with only the clothes on their backs, with a sense of hope. 100% of all funds raised until January 31st goes directly to children, with gifts as low as $7 making a huge difference. 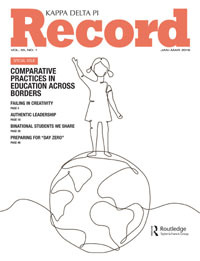 Information about the educational issues facing migrant children and their teachers is available in the January 2019 issue of the Kappa Delta Pi Record. Through January 31st, access one of its articles, “The Binational Context of the Students We Share: What Educators on Both Sides of the Border Need to Know,” for free by clicking here. Dr. Rose Cardarelli is a Kappa Delta Pi NGO Representative to the United Nations. On January 27, 2017, Kappa Delta Pi representatives attended the Committee on Teaching About the United Nations conference on the theme “Refugees: The 21st Century Challenge.” This conference brought together more than 700 educators from the United States and around the globe to learn about the primary challenges confronting refugees, and especially issues concerning education. A refugee is a person who is forced to flee their home country to escape persecution, war, or violence. Per the United Nations High Commissioner for Refugees (UNHCR), more than 21 million people worldwide are classified as refugees, with half that number under the age of 18. An additional 10 million people around the world are stateless, meaning they may have been denied access to any education. As educators, we are aware that education can empower and transform lives, reduce poverty, provide employment skills, and facilitate better health opportunities. Education can change lives, communities, and countries. Therefore, the plight of these refugees should concern all of us. Additionally, conference awards were presented for Excellence in Education and students’ graphic art posters. KDP representative Dr. Basanti Chakraborty was one of the award recipients recognized for the poster competition at the conference, on behalf of students from Balasore College. KDP was also acknowledged for its participation in the conference. Integrated Refugee & Immigrant Services (IRIS): This Connecticut-based organization helps refugees with education, English classes, after-school programs, summer school, and other resources. Mohawk Valley Resource Center for Refugees: This organization in upstate New York helps refugees through a community-centered program and provides educational resources to develop cultural competence. International Rescue Committee: The IRC responds to the world’s humanitarian crises through education and provides other services for people devastated by conflict and disaster. They are located in 40 countries and 26 U.S. cities. Culture of Peace and Non-Violence: This UNESCO site gathers resources related to peacebuilding, mediation, conflict prevention and resolution, education for non-violence, tolerance, acceptance, mutual respect, intercultural and interfaith dialogue, and reconciliation. Discovering My Identity: This lesson from Teaching Tolerance helps students describe aspects of their identities such as race, gender, class, age, ability, religion, and more. Global Campaign for Education, U.S.
KDP members are encouraged to review the UN website for NGO relations, where there is a wealth of information and resources enabling educators to cultivate global citizenship in their classrooms.